DASH as fast as you can! 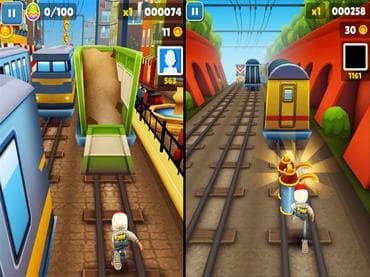 DODGE the oncoming trains in free game Subway Surfers! DASH as fast as you can! DODGE the oncoming trains! Help Jake, Tricky & Fresh escape from the grumpy Inspector and his Pitbull dog. - Grind trains with your cool crew; - Colorful and vivid HD graphics; - Hoverboard Surfing; - Paint powered jetpack; - CaLightning fast swipe acrobatics; - Challenge and help your friends. Если у Вас есть вопросы, связанные с игрой Subway Surfers пожалуйста используйте эту форму для связи с нами.